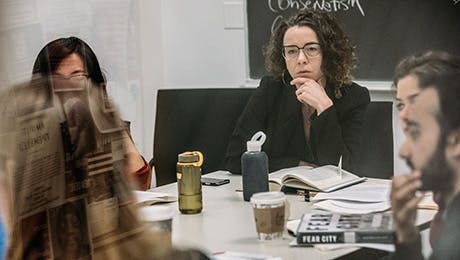 Courses in the Department of Anthropology explore the entwined concepts of “knowing that” and “knowing how.” All courses in the department follow one of two tracks. The “Perspectives” track examines different viewpoints on the subject of anthropological research. The “Practices” track trains students in ethnographic fieldwork and other research methods. This seminar introduces students to modern social theory, its historical anchorings, and its relations with the anthropological enterprise. It investigates how the concept of society and culture evolved in relation to humanist thought and political economic circumstances as Europeans explored, missionized, and colonized. This seminar will explore the legislation of fear and the power conferred on the concept of race to instill the affective and biological threat of contamination and contagion. We will be concerned with how affect legislates racial distinctions, and the taste and distaste that goes into deciding how those differences are drawn. It all started with some kind of melting. First, all that is solid melted into air. Then, whatever remained in air, began to melt into digital. Digital flows now account for a larger share of GDP growth than global trade in physical goods. This course aims at introducing graduate students of social sciences to heterodox studies of contemporary markets, capitalism and new currencies. Time and temporality are persistent topics in anthropology insofar as anthropologists attend to the diversity of repertoires for timekeeping as well as repertoires of temporal markers themselves. This seminar will review the ways in which the anthropology of time has apprehended and represented socio-cultural time, or multiple forms of social time, by considering accounts of the spatiotemporal constitution of meaningful worlds. We will assess the ways that time has been represented as socially constructed, thus accounting for cross-cultural temporal relativity. The purpose of this graduate seminar is to orient masters and doctoral students to the pragmatic, conceptual, and epistemological details of fieldwork and the reporting and narration of ethnographic work as it presents itself in the immediacy of everyday human experience. We will explore a broad range of issues from the practicalities of eldwork to the epistemology of research, from modes of analysis with various forms of data to ethical issues in research and trends in reporting and narrating ethnographic work.